Some of you may be curious about those microbes we keep talking about that do a lot of important work….metabolizing food waste and even pet waste. Yes….that’s right. You can ferment dog and or cat poop instead of putting it into the landfill. The same microbes that breakdown food waste will turn dog and cat poop into nutrients to feed the soil microbes for your ornamental garden. In the process the “waste” material is turned into something valuable. Instead of letting your waste end up in the landfill, you can with the microbes put it back to the soil where it will do some good. Why ferment dog or cat poop? It’s all about cleaning up the environment. We want to keep our water clean and free of pathogens. We want to reduce the amount of waste going to landfills. And we know waste put in the landfill generates a lot of methane and other gases that ultimately contribute to the heating up of the planet. In our last blog we gave 10 good reasons to get involved. We advocated fermenting organic waste instead of composting or discarding waste in a dump, because it is faster, easier, and simpler to do right at home. And if you love plants and gardens, you get the benefit of feeding those plants nutrients from enriched healthy soil and in doing this reduce your dependence on fertilizers and pesticides. We are not going to get overly technical here. But I think it is interesting to see what is going on in the process of organic waste being broken down to smaller and smaller molecules that can then be put back to the soil and recycled right at home. When the conditions are right, the microbes grown on the waste material break it down. They do this by releasing enzymes that disrupt membranes releasing nutrients. You can think of it like peeling a banana or peeling a tasty orange. The microbes are feeding on the cellular nutrients…..getting lots of sugars and other needed materials so they can survive. In the process they rapidly reproduce and the cycle continues with ever increasing numbers until the food source (waste material) is consumed. Some microbes are picky. They can only metabolize (breakdown and consume) certain types of food material and when they are finished, others move in and take over where the first consumers feast has ended. This goes on for awhile and ends when all of the “pickled” waste material in the soil is consumed. The wasted material that is put into the soil after bokashi fermenting may look little changed to the human eye, but on a microscopic level, it is very different from the waste put into the fermenter initially. It takes 7 – 10 days for the soil microbes to finish up their part of the job….breaking everything down to valued nutrients for the plants. And as we have mentioned time and again, it is this expansion of microbes in the soil in numbers and diversity and nutrients ending up in the soil that gives the garden plants a rich vibrant push forward. Restoring soil is important. Natural occurring microbes are restored in this process. When the enzymes break cells down and release the inner nutrients, liquids are generated. This accounts for a lot of the liquid that forms the “bokashi tea” we get from our food waste processing. When you dilute that liquid 1:100 and put it in the garden or on the house plants, you see good things happen. The plants become more lush and productive. You can even spray it on the grass. It will be better than those other fertilizers that end up in rivers and streams polluting our water and killing fish. Here is a highly magnified image of your typical bokashi tea taken through the microscope. All of those squiggly dots and dashes…..are microbes healthy and active. Chemists like to look at and identify what kinds of molecules are being generated when things breakdown. There are lots of ways to do this, but one of the very easy things to do is to take a diluted sample and run it through a specialized instrument that does a kind of CSI (fingerprint) analysis. When you look at the tracing from this instrument you get a list of materials formed. They show up as spikes when they cross a detector which records each and every substance in the sample. 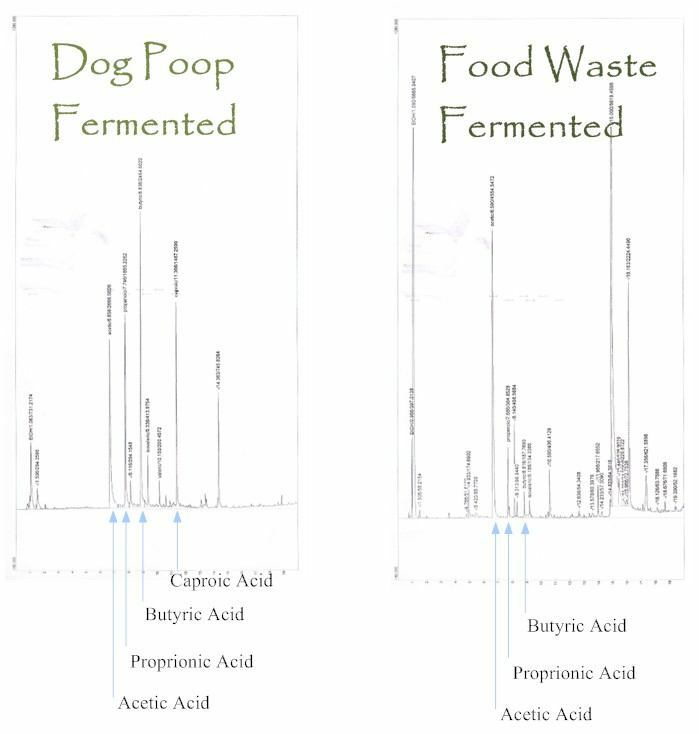 In the figure below you can see the “print” for dog poop and the “print” for food waste taken from samples that were allowed to ferment (decompose with microbes). It is interesting how similar the prints are one to the other. The dog poop “print” is remarkably similar to the pattern for food waste. In fact both produce virtually the same kinds of chemicals. We’ve identified several…..acetic acid, proprionic acid, butyric acid and caproic acid. Note that the dog poop print is less complicated than the food waste print (fewer end products appear in the trace). That makes sense since your dog already digested and in the gut absorbed many nutrients and products formed as food was being degraded. What was left over (in the poop) is the less complex non absorbed material that will be further degraded in fermenting. There are unfortunately potentially harmful parasites and pathogens in the gut that end up in the poop which is why we face always the potential real threat to contaminating ground water and landfill sites. The acids produced in the fermentation are very interesting. As many of you know, acetic acid diluted in water is vinegar. The other volatile fatty acids end up in the mix, like acetic acid because the microbes can’t efficiently get rid of them. You can think of them as annoying leftovers at the end of the feast. The microbes in a sealed anaerobic fermenter generate these acids that are a signal that the party is over… no more good stuff to eat. These acids however do some interesting things that turn out to be most beneficial. When you pour the fermented waste material (from food waste or pet waste) into the soil and let the soil microbes pick through the left over product, lots of things happen. Air is now introduced and a whole new set of microbes get a chance to work on the left over material. Those fatty acids disappear like candy as they are rich fuel aerobic microbes can readily metabolize. Some of you may be worried about pathogenic microbes, especially when we talk about fermenting dog or cat poop. As we noted above in our chemical analysis, a number of acids are formed including butyric acid. These fatty acids are powerful inhibitors that help kill those pathogenic microbes. It turns out that butyric acid, proprionic acid, and other small chain fatty acids are toxic to coliforms including E. Coli and Salmonella (known pathogens that do contaminate ground water). The pathogens die off in a fermenting system while other microbes are breaking down the poop. If the system is sealed and given time to complete its digestion which takes about 7 days, the chances of getting ground water contamination are very much reduced. When poop is allowed to sit on the surface or even when buried, it takes a long time to completely breakdown. It attracts flies, is foul smelling and an unwelcome addition to the grass or garden. When it rains or with watering the pathogens in the poop are carried into lakes and streams and end up in water we need to keep free of contamination. A properly functioning fermenting system is very efficient because it converts the poop or food waste to something of value and gets rid of the heavy load of pathogens that would have otherwise been sent to the landfill or left in the soil to contaminate ground water. Fermenting returns nutrients to the soil. It keeps water from getting contaminated. 3M makes a simple Petri film kit that can be used to rapidly test for coliforms including E. coli. 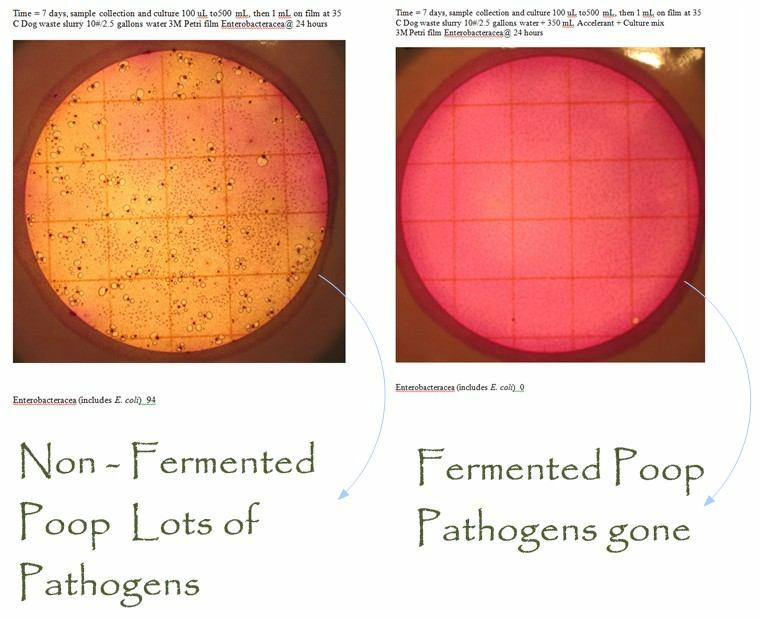 In the last two pictures you can see what happens to the E. coli/coliforms in the fermenting system compared to a non-fermenting system. They don’t make it through the system. In this experiment 10 pounds of dog poop was mixed with 2.5 gallons of water. A sample of this slurry was set aside and tested on Day 1 and Day 7. A second sample identical to the first except the culture mix powder was added was also tested on Day 1 and Day 7. On Day 1 as would be expected the colonies of microbes where very high and easily detected in both samples. 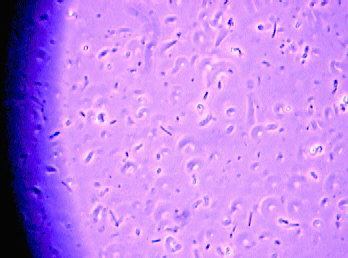 On Day 7, the sample that had been fermented (right hand image) showed no evidence of surviving pathogens but the sample that was not fermented (left hand image) had abundant colonies of microbes showing. We have tested fermented food waste systems on numerous occasions and find no evidence of pathogenic microbes in our cultures on Petri film. In summary, fermenting organic waste appears remarkably easy and beneficial with a much lower probability of soil and ground water contamination relative to other treatment methods (composting or landfill operations) that have been employed. Eliminating noxious odors, flies and rodent problems and getting nutrients cycled rapidly back to soil for your plants is an additional plus.